Brand Navigator provides many services which will add value to your Internal Communications. This tool works by feeding planned information to TV or computer screens “Digital Signage”. This tool is particularly effective when talking to an audience who do not have access to email as well as staff who are illiterate. This product would add value to all the departments within your organization as you can plan and adapt the content around your own needs from a remote location. Companies are using it to communicate live data, production or performance stats and targets, safety, induction, training, company information, corporate profiling, annual reports, newsletters, it can even be used as a radio station. It has a superb live-data-capacity and can interface with any active database, be it performance-related or even as functional as booking a boardroom. BRAND Navigator offers a turnkey solution i.e. designs of technical infrastructure through to the digital communications strategy which goes hand in hand with the system. Although traditional communications models do work, digital platforms require a fresh approach which takes into consideration audience expectations and needs. BRAND Navigator manages the project through a team who specialises in using tactical and creative methodologies to reach an organisation’s strategic objective. We are fully aware that great content is what keeps digital signage powerful and would be delighted to see how we can assist you with content and expansion of your system. The offering we have uses the IT network as the platform. It is really suitable for SA and other remote sites, especially in Africa, on account of it not being bandwidth-intensive. The system interfaces with the IT network and operates on a forward-and-store principle, which you may be familiar with. 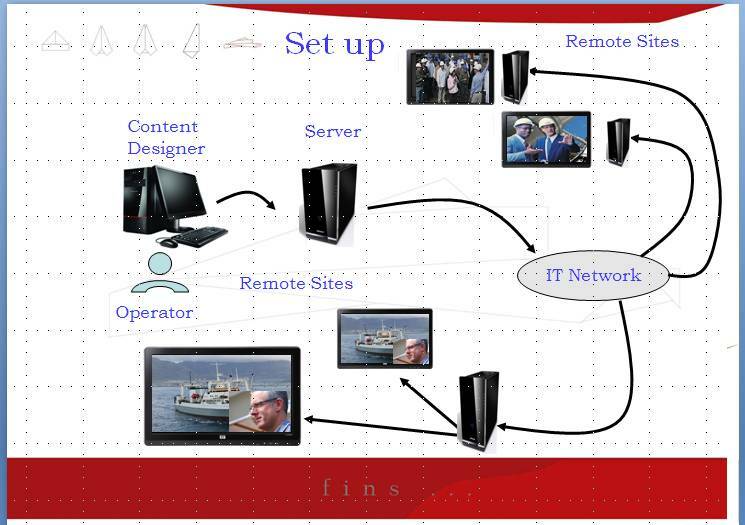 Compressed data - video, flash, graphics and audio - is sent via the network, usually during off-peak periods, to remote Media Points which are in turn connected to AV devices, these could be conventional TV’s, LCD and Plasma screens or data projectors. A controller, based centrally, then initiates the playing of the files via a Scheduler. The diagram below gives an idea of the structure of the system. It being a true narrowcast system means you can screen different content simultaneously on different devices on a 24/7 basis. Over 4000 international organisations, including 80 international airports use this system which has been operational since 1994. Companies using the system all indicate that the system has made a massive difference to not only general communications but to safety and culture shaping.